If you missed the overview on the cleanse, read about it here. Rise and shine. I can do this! I am pumped. I am also saving a ton of time. No need to cook or eat breakfast. This is awesome. The juice itself is not bad. It tastes very healthy and fresh. The flavours aren't bad. I drink it very slowly. It is thicker then I expected. This juice makes my tongue super red and that amuses me. I am still feeling great. I realize that the first two juices of the day have the most calories so I try and savour them. I have a minor headache but not too bad. Likely due to not having my daily coffee! I am starting to feel hungry. I have a big craving for a bagel. I smell people heating up their lunches and I start feeling grumpy. This juice tastes much better than expected and that cheers me up. I am recommitted. Anto gives me some encouragement and tells me I am not allowed to give in and eat a bagel. I nearly left there without paying because I had to pee so badly.. by this point I have probably had about 2 or 3 water bottles full of water in addition to all the juices. Pee count: approx 3. or 4. Mood-wise, I pretty much went back and forth between feeling wonderful, proud and happy, turning my nose up at everyone and their unhealthy foods (in my head of course) , and feeling grumpy, annoyed and irritable and just wanting to have some coffee ( and bagels and pizza..and..and). Big treat- not as delicious as coffee, but warm and yummy. See how quickly we can learn to appreciate something? It's hard to believe but I actually feel quite thirsty. I need to refill my water bottle. Do I always make so many typos or is because the juice is starting to get to me? I look a little tired. Is my skin glowing yet? I am feeling more zen and much better then in the morning. Maybe my body is adapting. Cheers! 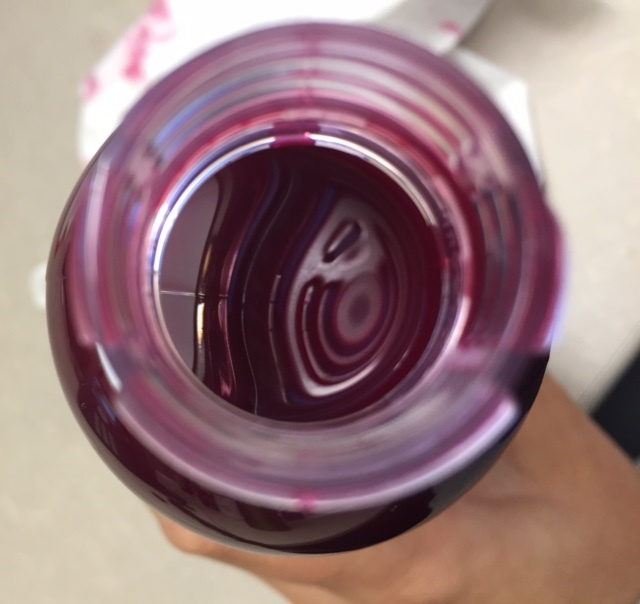 From this angle it almost-kinda-sorta looks like red wine.. I went to vote and then went home and drank this next juice. Resting my foot. I am not in the mood drink more juice. I am now craving eggs, cheese, avocado and lasagna. Drank this one in the bath. Green 101. I might be complaining a bit but overall I feel pretty good! I am liking this cleanse so far. Night cap anyone? cheering for the Jays? watching the election? I would say some celebratory drinks are in order. Green 201. ** Having now tasted this juice, I think I will take champagne next time. Greens 201 is definitely the worst/ most intense one..probably the most beneficial. S also texted that it is "the worst, by far" "brutal" and "hard to drink this" Hahaha. 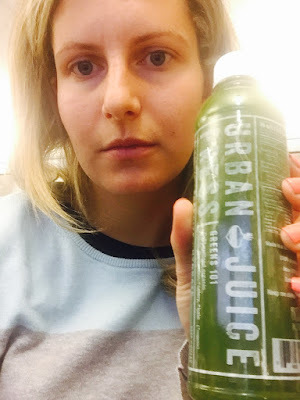 And with that, it's on to day two..
Read about Day 2 - Day 3- Post Cleanse.